Here are some preliminary contests to hold the week prior, with finals and awards the night of the Science Shop. 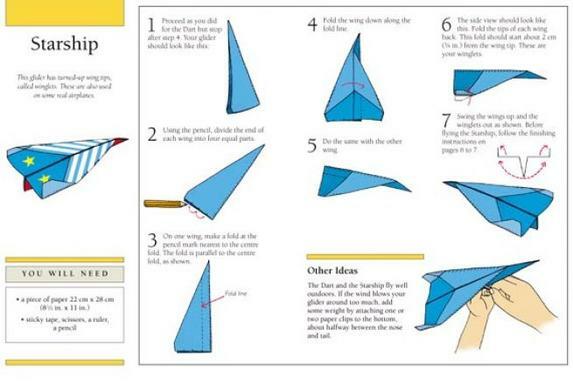 Scroll down for paper plane templates. Make a starting line. If you are inside, you can use masking tape or a ruler. Outside, a yard stick or piece of wood can work. Stand behind the staring line and throw your airplane as far as you can. The person who throws the farthest is the winner! The goal is to create unique designs on each airplane. Examples are "Most Colorful", "Most Realistic", "Most Futuristic"...Use your imagination! The goal is to get the airplane to land in the hoop in as few throws as possible. Make a starting line as in the Distance Throw. Next, set up a large ring on the ground (a hula hoop works great!). All participants need to stand behind the starting line. The first person throws his plane toward the hoop. The second person throws, and so on. After each person has thrown, the first person picks up his plane and takes his second throw from the exact spot the plane landed. The next person throws, and so on. The person who gets his plane in the hoop in the fewest throws wins. You can play several rounds, moving the circle different distances each round. You may want to keep track of each person's score on paper to make it easier. Or, you can just start a whole new game after each person has hit the hoop! You can also play this game while trying to hit a target instead. Participants stand across from each other. Each person throws her paper airplane toward the other. Try to catch your partner's plane. It's not as easy as it sounds! The winning pair will be the one that catches the plane the most times in one minute. Set up various targets. You can stack yogurt containers on top of each other, stand up action figures, place various size boxes around. See who can win at hitting the target or knocking the target down! Have one participant hold a stop watch. The other players takes turns throwing their airplanes. The person with the stopwatch keeps track of how long each plane stays in the air before landing. The plane that stays in the air longest is the winner!